Apartment is situated in a modern and brand new building with a garage and security. 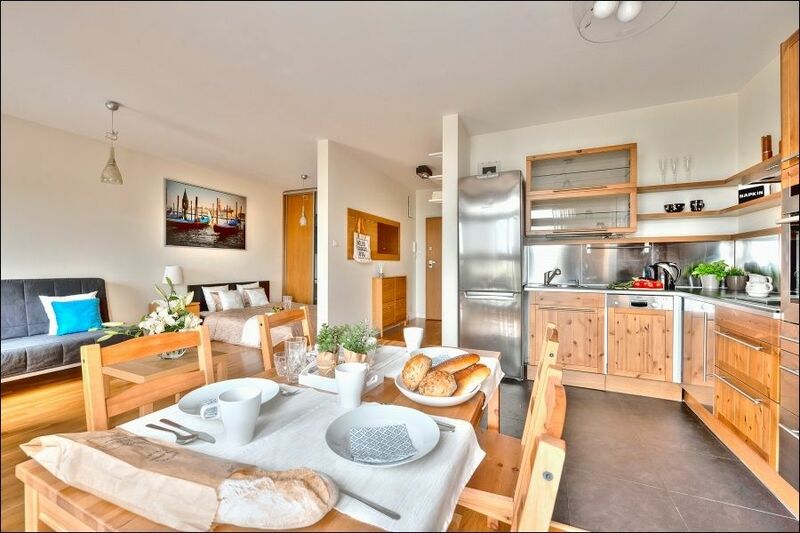 This completely furnished holiday rental is perfect for travellers seeking an alternative accommodation in Warsaw and can easily accommodate up to 4 people. The apartment offers you such amenities as wireless internet connection, cable TV, ironing board, vacuum cleaner, bed linen and towels. The building has two-levels, underground garage and eight fast and silent elevators. The Arkadia edifice is fully adapted to disabled persons. The area is separated and monitored by 24H security. Door-phone is available in each apartment. Two receptions are at your service in the main lobby. Close to the Royal Castle and other main tourist attractions. Arkadia 4 apartment is a great accommodation option when exploring the Polands capital. This holiday apartment is located within a walking distance from the Old Town, Nowy wiat, Krakowskie Przedmiecie, next to the Dworzec Gdaski metro station and to the biggest European megastore with hundreds of shops, restaurants and cinema, banks, cafs, and a private clinic. With this apartments alluring atmosphere and the vibrant neighbourhood you will be able to experience the best that Warsaw has to offer! Garage is extra paid. Nous avons passé un très bon séjour ! L'appartement est idéalement placé et très joli. Petite remarque : un rideau de douche serait agréable afin d'éviter de mettre de l'eau un peu partout... Sinon, rien à redire ! Everything was just like promised. A very pleasant stay in a great city. Especially the closeness to a big shopping mall and to the underground station are very handy. El apartamento esta muy bien. Cumplio nuestras expectativas. Llegas al centro rapidamente tanto en autobus como en metro. Apartments are above our expectations. Favourable location, 5 min to the metro or bus stop, or Arkadia shop mall. Host pays a lot for attention to details in apartments, branded towels, excellent equiped kitchen. We highly recommend to choose this apartment. Very good secure location with excellent value for money. Secure parking. Booking in with P&AO very efficient although 4pm booking time I0fel very late ,prefere 2or 3 pm. Every thing is in the apartment you require for a comfortable stay. Unfortunately the cleaners are inefficient and the floors were very dusty. Siamo stati molto bene in questo ampio monolocale ,poco distante dal centro e servito da mezzi pubblici molto efficienti .Ottima la privacy e l'appartamento dotato di ogni confort.